GREEN BAY — For two decades the Cup O' Joy has hosted faith-based music on Broadway Street on Green Bay's west side. "The Cup," as it is known to volunteers, artists and regulars, will mark its anniversary with a benefit concert on Sept. 12 at the Meyer Theatre (see box). Jan Oettinger, coordinator of operations, has been part of the venue for Christian musicians since shortly after it opened at its original location in 1989. It grew from humble beginnings. The original space, located down the street from the current location, was built as a shoe store in the late 1800s. It was a print shop prior to becoming the Cup O' Joy. The only electrical outlets were in the ceiling for the printing presses and artists performed under a bare light bulb. Oettinger and her husband, Mike, both musicians, joined three or four other families to build the music ministry. A stage was built and the building was rewired. Oettinger took on the task of booking musicians and organizing volunteers, which she still does today. In 1999, the Cup moved to 232 S. Broadway. "We wanted to stay on Broadway," said Oettinger, known as Jan O to many. "It was important to stay on the street. We felt like we had developed something special in this area." The Cup would not be possible without volunteers and donations, she added. Approximately 100 volunteers, representing 35 different faiths, including several Catholics, serve the music center. There are no paid staff members among the lighting and sound technicians, snack bar workers, cleaning crew, Web site coordinators and those who provide meals for the artists. 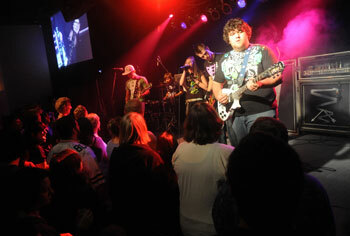 The Cup offers 104 shows per year with music ranging from bluegrass to hard rock. All shows are free with no cover charge. Financial donations are requested of concertgoers. "I offer every artist the same wonderful deal," said Oettinger. "They get to keep what they get in the can (donations). They keep coming back. It's really about building relationships with the artists. I think they like it here because the audience members are participants. The artist and audience connect. It's a relationship thing." What: Benefit concert featuring Shawn McDonald with special guest Joy Williams. Where: Meyer Theatre, 117 S. Washington St. in Green Bay. When: 7 p.m. Saturday, Sept. 12, doors open at 6 p.m.
Tickets: $10 general admission or $15 reserved seating in advance, $15 general admission at the door. Available at Lighthouse Books, Q90FM and Cup O' Joy (weekend nights only) in Green Bay, Family Christian Store in Appleton, Basic Books in Oshkosh, The Christian Bookstore in Manitowoc or order online at www.cupojoy.com. Donations will be collected to support the Cup O' Joy. John Waller, who recorded the song "While I'm Waiting" for the film "Fireproof," performed at the Cup in July. Oettinger points to the concert as an example of the audience lifting up the artist. "John had been on the road for a long time," she said. "He told the audience that he was burned out and wanted to be home with his kids. By the end of the night, you could see that the audience had ministered to him. It's give and take. The audience talks back to the artist. They are listening. "A lot of artists end up playing places where they are the background to complement whatever else is going on," she added. "When artists come here, they enjoy it because it is a concert setting. The people come to hear them perform." Waller drew such a big crowd that people had to be turned away. The Cup has a capacity of 350. Furniture is removed to create space for some shows, and the basement has speakers and television screens to accommodate overflow crowds. Oettinger said her personal reward is seeing people touched by the music. She recalls a story about a young man who saw the band Disciple at the Cup. "He had e-mailed me," she said. "I knew he liked Disciple, so I let him know that they were coming back for another show. He told me that the last time they were here was the last time he did drugs. He later got yelled at in school for having a Bible. Most nights I'm making sure the popcorn isn't burning, so I don't know what is going on in the audience. Here was this kid who was so moved by the music of this rock band that he made changes in his life." In addition to major Christian recording artists, the Cup offers opportunities to local musicians. Some are discovered through open mic nights. "We've had people who have started at open mic who are now doing full-time music ministry," said Oettinger. "If I can find someone who knows three or more chords and can stay in tune, I will use them. If you have someone in your church that you think is talented and they would like to bring their music outside of the church walls, we would love to incorporate them in some way." Oettinger said the Cup, which is alcohol and smoke free, is designed to enhance people's faith lives. "I want people to go back and be better participants in their church, because they were inspired to be closer to God through their experience here," she said. "Many of the artists talk about their faith. A lot of times people will bring someone along. Music is a great way to share your faith. If you bring a friend, invite them to church with you. We are just a little seed planting thing here."